Blooming habit at Carrizal Bajo, Atacama, Chile. Origin and Habitat: South America, from central Chile (Antofagasta, Atacama, Coquimbo, Libertador General Bernardo O 'Higgins, Santiago, Tarapaca, Valparaiso) to Peru, (Ayacucho, Arequipa, Moquegua, Tacna, Ica and Lima). Altitude: 50-3500(-4200) metres above sea level. Habitat: Cumulopuntia sphaerica is a most common species widespread in a wide area from the seaside to high elevations close to the timber line, in somewhat dry areas where the drought may last 3 to 5 months. It grows almost everywhere in many different habitat both on flat terrain and slopes generally at not very high altitudes but higher in more northern (tropical) part of the range where it can be found well above the 3000 metres. In both mesic, arid and very arid environments with rainfall ranging from a maximum of 800 mm per annum to less than 100 mm per annum, and in some years it is possible to have no rainfall at all, but with protection from direct sun through coastal fog (camanchaca). The species thrives in areas fully exposed to the sun, both in level areas and slopes facing north. Cumulopuntia sphaerica is extremely abundant. It is an invasive species, and its population is increasing. This species is not utilized. 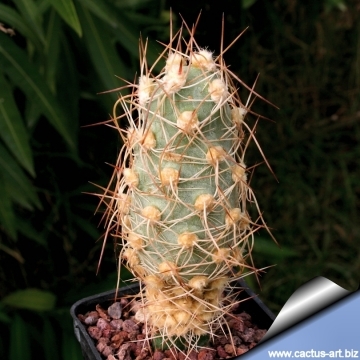 Description: Cumulopuntia sphaerica is a xerophytic, summer-growing, species adapted to dry soils that, like many cacti of the Peruvian deserts, present some problems in cultivation. It is in fact somewhat rot prone if kept in a non ventilated place. Soil: It requires a very fast draining drying mineral, sandy-gritty cactus composts. Provide a very good drainage. Repotting: Repotting will increase the number and size of stems, and will increase the number of flowers produced. Repot yearly until the plant reaches about 5 cm in diameter, then every two or three years will suffice. Repotting is best done at the end of winter, but it can also be done at other times. Do not water for a couple of weeks after repotting, to reduce the risk of root rot via broken roots. It needs deeper pots to accommodate the big tap root. Pot bound, starved plants will rapidly look tatty and won’t flower well. Exposure: It needs an absolutely airy and sunny place this brings very healthy plants with a good spination and flowers. .
Watering: Water and feed in the vegetation period from April until to mid of September, keep dry and cool in winter, they have to be stimulated to bloom by dryness and you may give them water first when the plants start to produce the new buds. Water it less than average if in bigger pots. 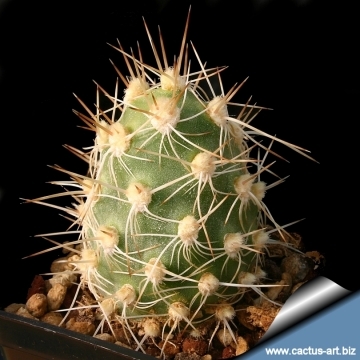 Hardiness: This species requires higher temperatures in summer and winter than many of its relatives, as it grows in the nature together with Melocactus peruvianus, too. The plant does not tolerate snow, but can tolerate occasional freezing spells of about - 5° C (the typical morning frost of central Chile). For safe cultivation it needs to be kept in a cool place (min. temperature around 5° C) during winter rest. This is important for the flowers as well as for their health. Without this cool winter period they normally won't get many buds. Heat tolerance: Cumulopuntia can endure standing heat. - Red spiders: All, especially the young, are susceptible to red spider mites. Red spiders may be effectively rubbed up by misting the plants from above. - Mealy bugs: Mealy bugs occasionally develop aerial with disfiguring results, but the worst types develop underground on the roots and are invisible except by their effects. Propagation: Seeds, grafting or (usually) cuttings. The seeds can be sown in pots of fine, well-drained sandy soil, any time during the spring when temperatures are warm. The seedlings should not be disturbed until they are well rooted after which they can be planted separately in small pots. Cuttings of healthy shoots can be taken in the spring and summer (let dehydrate the cuttings for a few weeks and the roots will coming quick) Once the callus forms, the cutting may be inserted in a container filled with firmed cactus potting mix topped with a surface layer of coarse grit. They should be placed in the coarse grit only; this prevents the cut end from becoming too wet and allows the roots to penetrate the rich compost underneath. Cuttings will take root in a minimum temperature of 20° C (but better in hot weather). 5) Faundez, L., Cáceres, F., Saldivia, P. & Ostalaza, C. 2013. Cumulopuntia sphaerica. The IUCN Red List of Threatened Species 2013: e.T151803A563257. http://dx.doi.org/10.2305/IUCN.UK.2013-1.RLTS.T151803A563257.en. Downloaded on 18 February 2016. 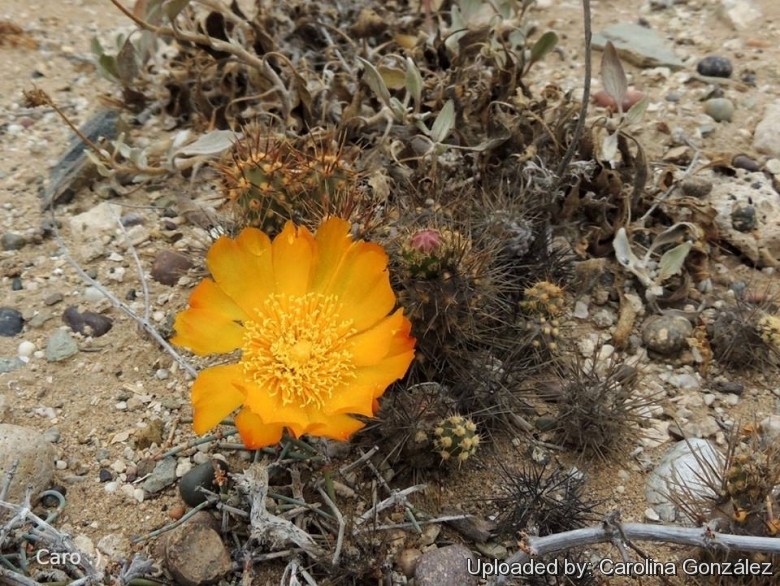 Cultivation and Propagation: Cumulopuntia sphaerica is a xerophytic, summer-growing, species adapted to very dry soils that, like many cacti of mountainous areas, likes bright light, cool and dry conditions in the winter; this is important for the flowers as well as for their health. It is somewhat rot prone if kept in a non ventilated place. Exposure: It needs an absolutely airy and sunny place this brings very healthy plants with a good spination and flowers. Hardiness: These plants tolerate light frost (- 2 °C for a short period). They need to be kept in a cool place (min. temperature around 5° C) during winter rest. This is important for the flowers as well as for their health. Without this cool winter period they normally won't get many buds. Heat tolerance: Cumulopuntia cannot endure any standing heat.